For a while now I've been slowly putting together a collection of ideas for an "idealised" Enterprise-C interior, one that (like the Probert concept) doesn't lean quite so heavily upon the Movie-era aesthetics of a good 40 years earlier... The intention is to create a set of rough blueprints, mockups, and PS paintovers for the commissioning of a new Bridge and other areas in 3D, and to better flesh out the "lost years" before TNG. With that in mind, below are the first rough images of what direction I'm taking the Okudagrams in: A "final install" version, which hints at the LCARS to come. The colors are currently sticking to the movie era, but that may yet change. I'm pretty satisfied with the "door control" type panel layout, but I know the other input panel needs a bit more fleshing out. Ideas? Suggestions? Nice! Do you use Inkscape or PS? I'm definetely looking forward to see more! Glad you're posting these! Certainly nothing low-level here, keep at it mate! 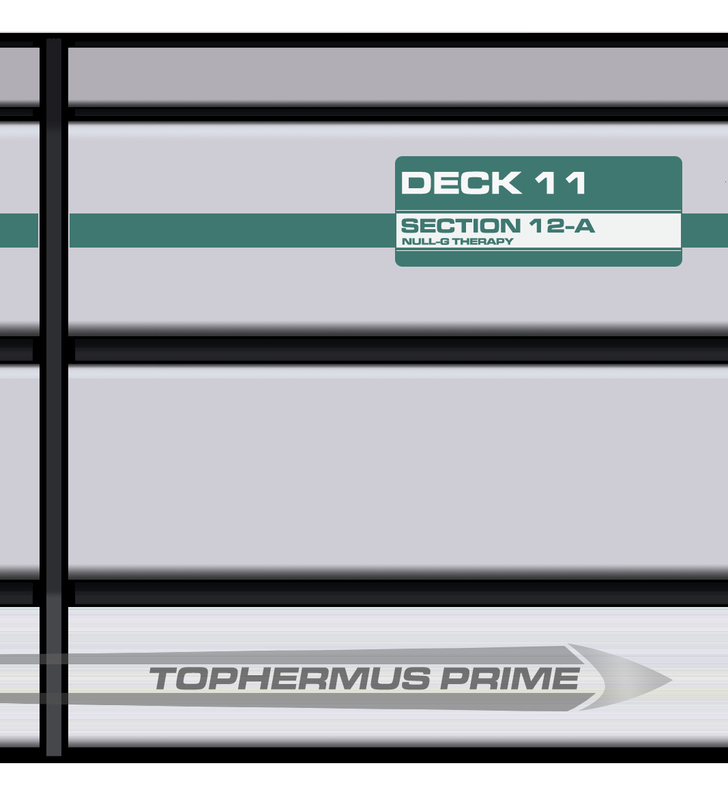 So here's another element I've been working on; corridor deck/section signage. 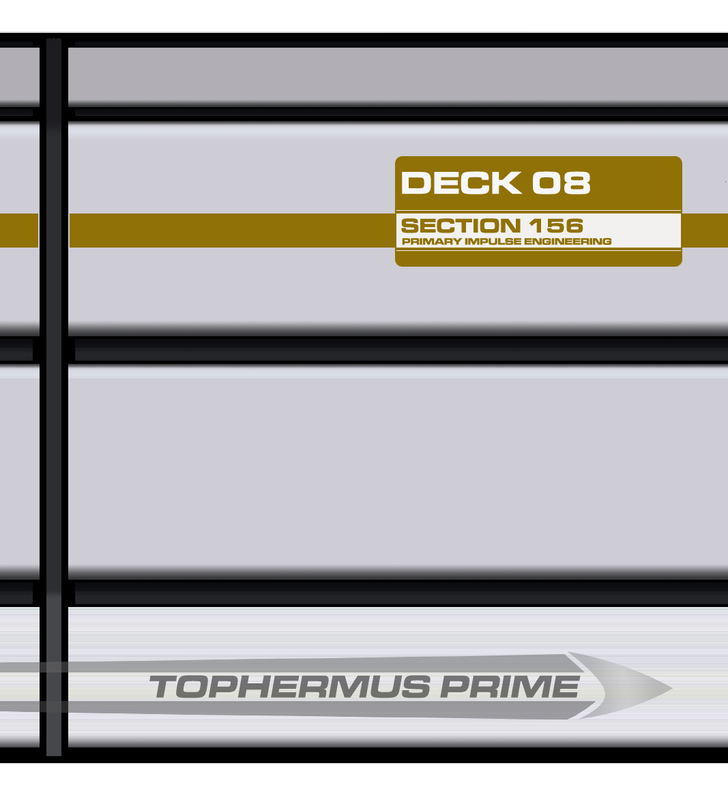 I'm basing these primarily off some of the old TNG pre-production concepts done by (I think?) Mike Okuda, as I felt they made an ideal go-between for the Movie and early TNG eras. 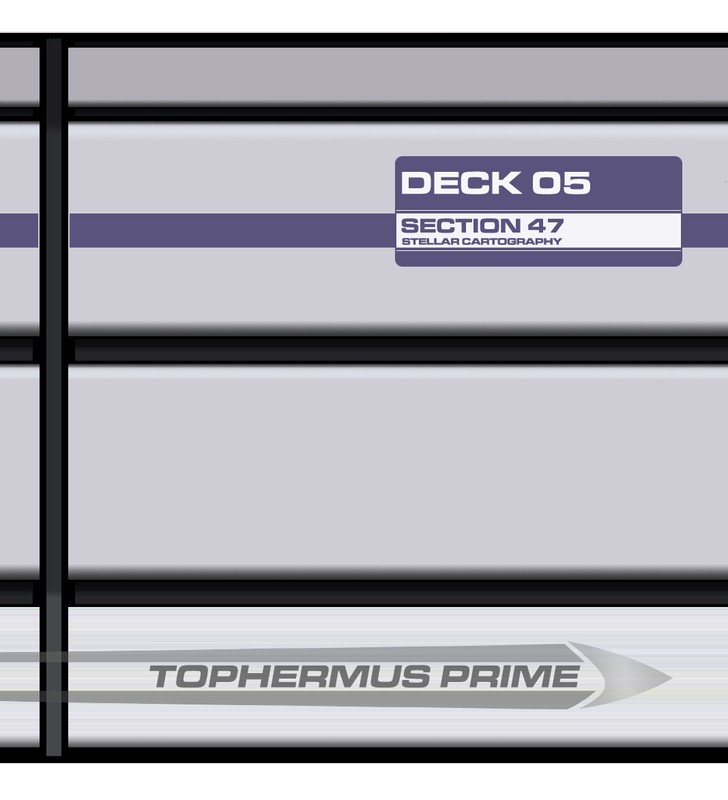 The colors are intended to match up with the various Movie-era divisions, to denote the function of a particular section in that deck. mdta thanks for sharing those; they may be handy for the Constellation bridge (and possibly for what she looked like when launched!). :thumb: I love the extra commentary regarding how they were expected to function! 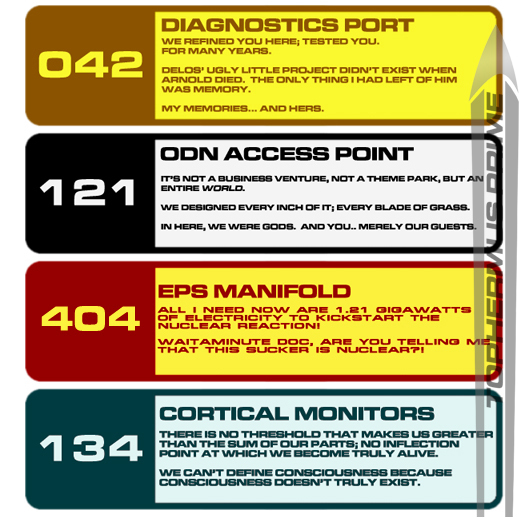 What I'm working on here is a link between the Generations style of Okudagrams and labelling/signage, and what we saw by the time of early TNG. You should consider the colour scheme and font choices. The font type is staying as it is; though as I mentioned in the initial post I may decide to tweak the color scheme (not much, as I'm quite fond of the traditional palette - and besides which, remember that early TNG was more of a mix of olive green and blues). This stuff is all super nice. 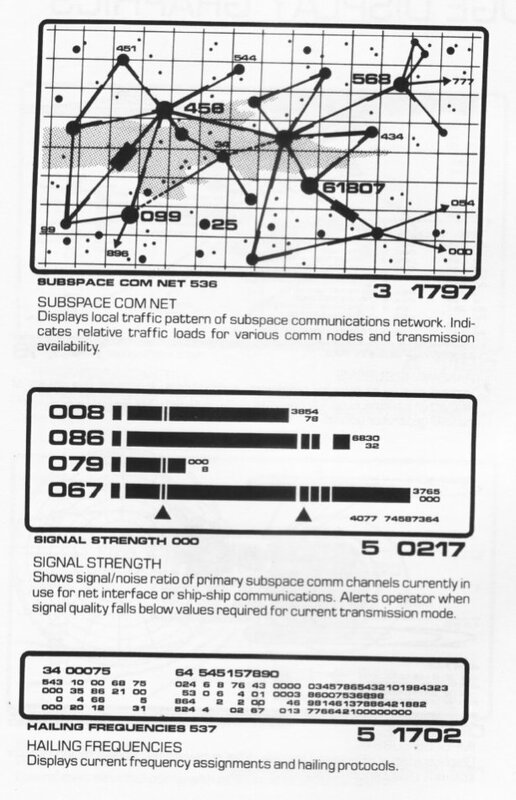 I have been thinking about the not-okudagrammed-LCARS-without-copyright-replacement for my universe and how to make it nice without looking like I'm trying to copy Star Trek. Since you seem more skilled than you're willing to admit, mind giving us starters some tips, and then passing judgement on our vague attempts to mimic your work? ... And would we have to call you Sensei? Maybe my best piece of advice with regards signage or GUI would be to first get a good example of an existing design / style that you like, and then rework it to create a "visual reference", adding and removing elements until you reach a look that best suits what you're aiming for. Once you've arrived at an aesthetic that you like, you can use that visual ref to create new pieces based upon it. 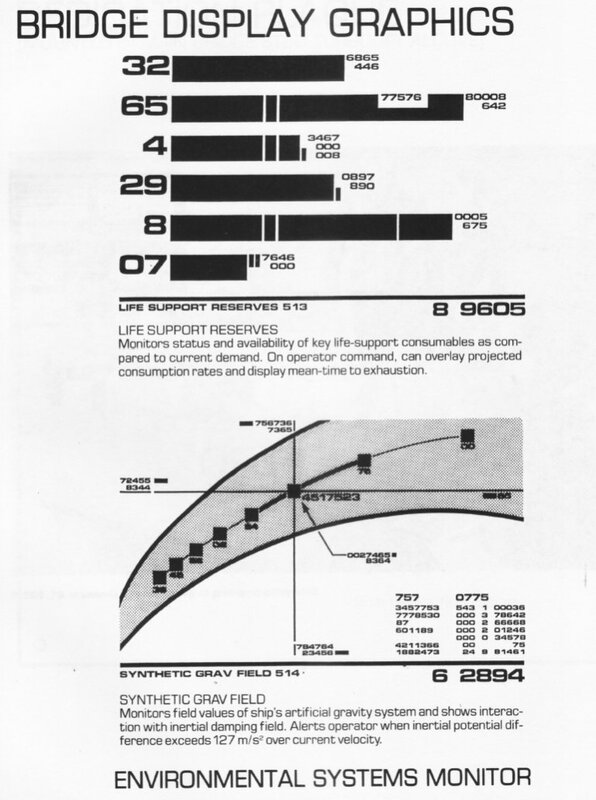 Initial idea for what the early bridge display screens might have looked like for the USS Constellation prototype at the time of her launch by the late 2270s/early 2280s... 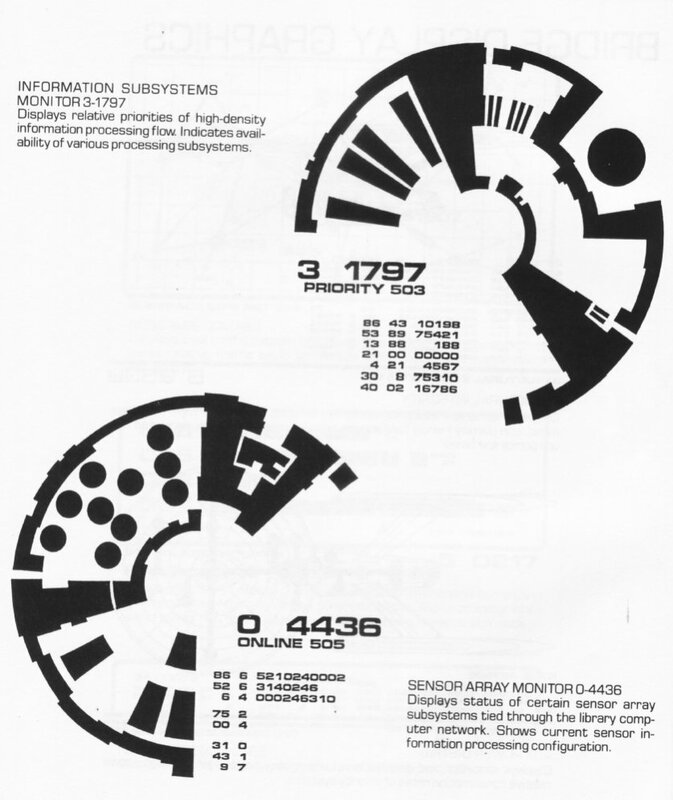 The layout is based upon one of Uhura's upper displays, while the content is informed by one of the TWOK-era Engineering readouts. 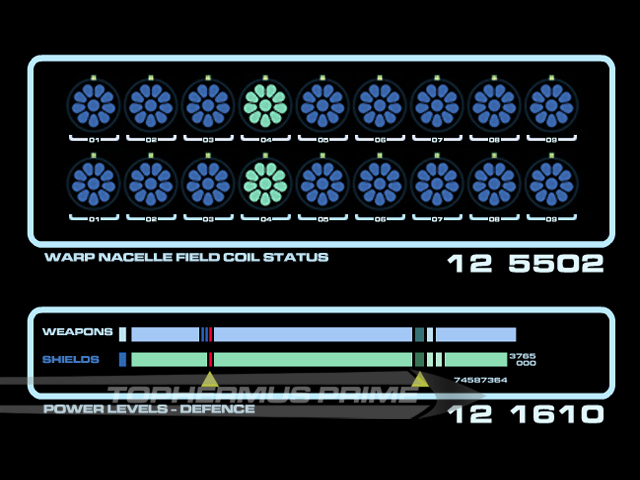 I'm looking to strike a balance between the background screens on the USS Saratoga at the start of The Voyage Home, and those we saw on the Enterprise-A at the end; so I may yet decide to make the graphics borders thinner and square-edged (or even lose them entirely), and add a smidgen more color. I've added a touch more color ala the Saratoga's displays for this one; I'm pretty sure I'll be going with straight-edged and incomplete borders from here on in. Really nice! I love the TVH/Ent-C okudagrams, they look a lot more fresh than the TUC style I think (maybe because we saw less of them). Cheers! 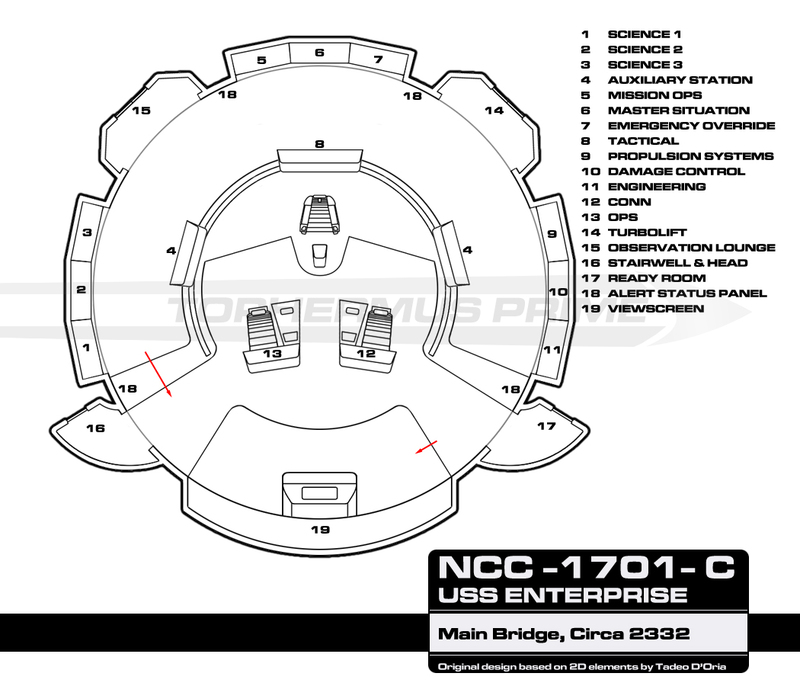 Yes, I always felt that was a missed opportunity not seeing the full 1701-A bridge... Though I'll also say I'm finding I like the Saratoga's "blues plus some colors" palette a bit more. The first was designed to be an amalgam of TVH and TUC aesthetics, reflecting the exterior design itself; while IIRC the second was intended to depict how the class would look after its first refit. 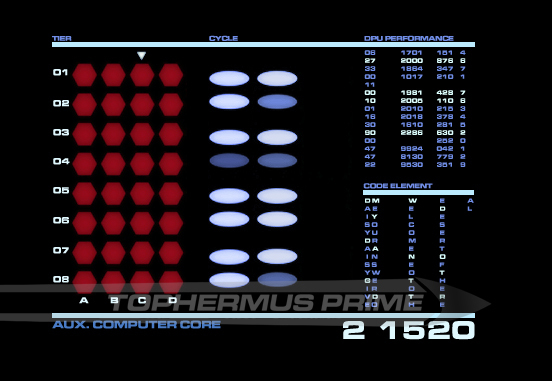 The Helm consoles were -roughly- based upon the Excelsior type seen in STIII. Almost forgot to post this! 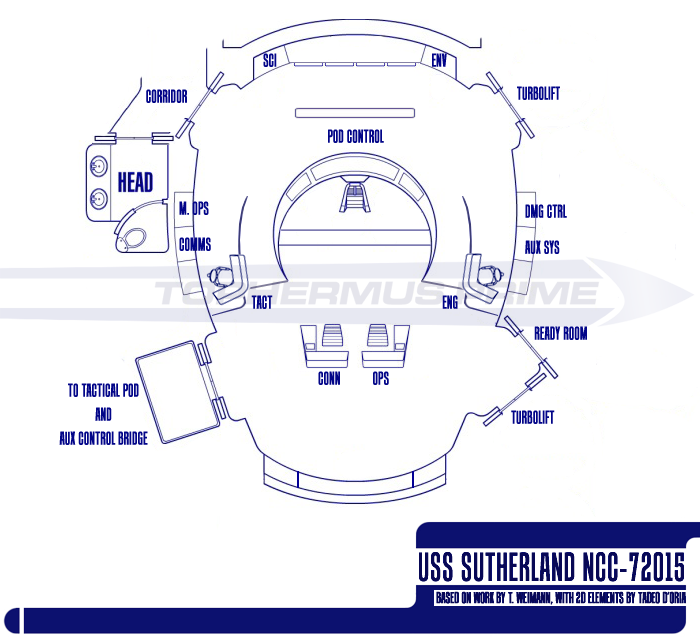 With @Rekkert's generous approval, below is my extensive rework of one of his previous commissions' floorplans into the Main Bridge of Ambassador-class USS Enterprise, NCC-1701-C. The design here takes elements from the Galaxy-class (providing the initial 2D components), as well as Excelsior, SeanR's bridge, and a couple other designs. 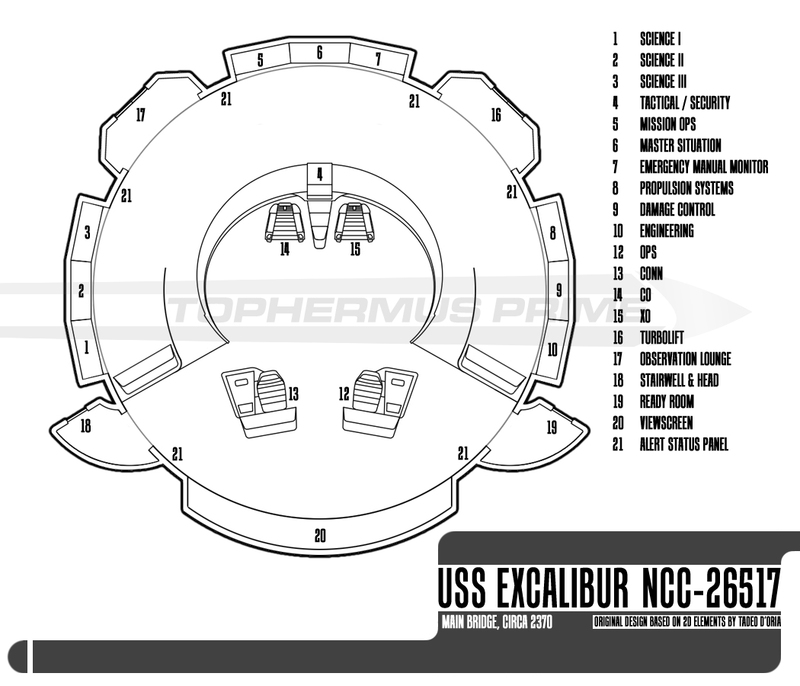 At some later stage I'll be posting the TNG-era USS Excalibur (as well as working up a side profile of the walls/consoles and drawing the faces of the consoles themselves, which sit midway between TNG and TUC). And yes: that is a table for a tea cup. NB: I know the canon-obsessed will cry havoc, but the bridge we saw was IMHO from anything but a Ship of the Line. I'm going with the interpretation that it was either Auxiliary Control, or a predecessor to the TNG Battle Bridge (since it was the same set as the TNG S3/4 Battle Bridge, it'd make sense). I had the same feeling about the Sutherland bridge we saw in TNG's ""Redemption II."" That looked more like an auxiliary control room than a proper bridge. My assumption was it was either that or a temporary bridge. I actually had in mind a re-dress of the Constellation bridge that Rekkert just did for an Ambassador bridge with similar console placement. This would be as it appeared starting in the early 2350's (with the newer LCARS computer system) as well as doors flanking the viewer (ready room and turbolift) while the aft doors are a turbolift and egress corridor. ETA: Here's the (WIP) blueprint @Rusty0918; I'll avoid posting the PS drawover I'd been working on for now, as once I took a look at it I remembered there's quite a bit to do still as yet! 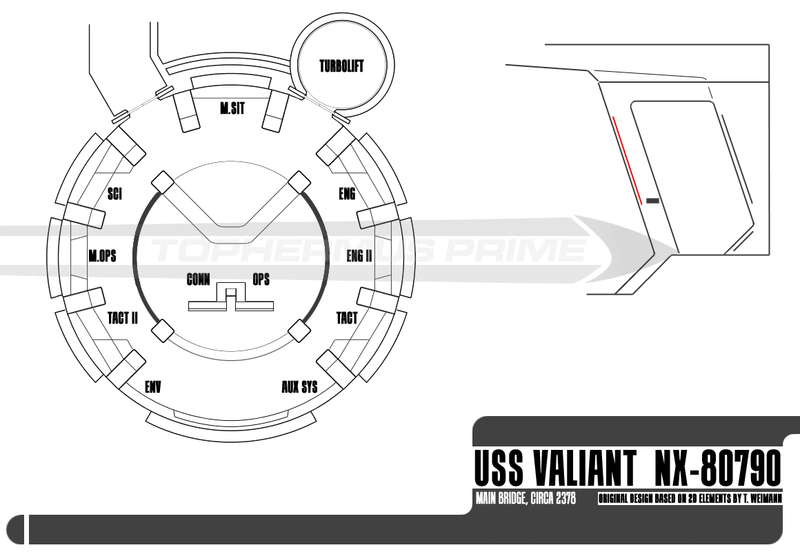 Retcon of the USS Excalibur bridge from the Peter David ""New Frontiers"" comics and novels based on my above reimagining of the Enterprise C bridge. As with the comics version, it's not much different apart from the obvious horseshoe rail. Interesting! I like that Excalibur bridge very much! Is that a Parallels style horseshoe? Thanks @Rekkert! 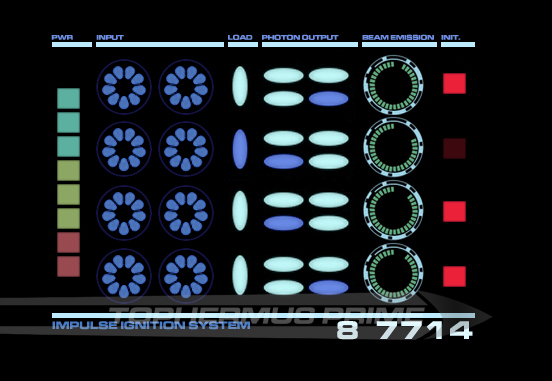 It sort of is; IIRC I had in mind a simpler version (without the lit strips, and the LCARS panel being set at a better angle than the canon one). 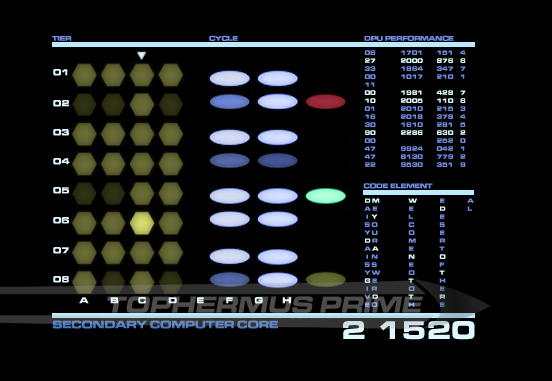 The console between the two command seats is based on the units Troi and Riker used on the Ent-D. Cool stuff. I like that bridge design for the Excalcibur. 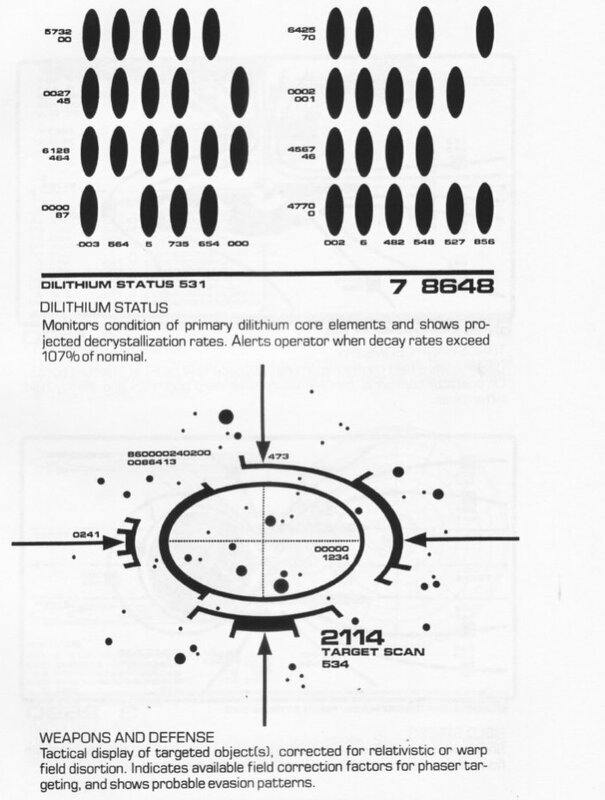 This is a late 2370s ""generic Warship / Battle Bridge module"" designed to plug in to new generation warships (sorry, escorts) post-Defiant, as well as into the secondary hulls of standard large Explorers such as the Galaxy and Nebula-classes. The basic version gets plugged into warships unmodified, while implementation on other vessels involves some minor aesthetic mods. 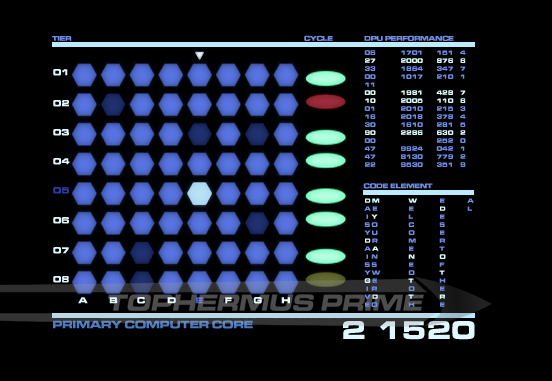 The example here was installed to the prototype for the Valiant-class. Included is a cross section of the main buttresses, based on the profile of the TFF/TUC era versions; but a little sharper edged, and at something like 2.5 times the thickness. The image isn't finished, as there are some further changes needed (eg two different versions, appropriate seating, etc etc...). You know Starscream - when the USS Galaxy gets upgraded to BGO edition (in my continuity), I was thinking the battle bridge could be further modified to have a few Defiant-class elements, since it she is refitted to be more war-ship like. Well, the USS Galaxy in Battle Group Omega edition does have Dark Warship Gray. The idea is she's the flagship of Battle Group Omega and she's refitted into a 3-nacelled AGT variant. Ah, I see. Would you not be doing a hefty refit (or rather, replacement) to the main bridge in that case? Those smooth curves etc don't lend themselves to dark greys - a more Sovereign style might work better in that color. Eh, Battle Group Omega has a Sovereign-class vessel, so using the same bridge isn't really an option.